How to Keep Your Custom Shutters Looking Great! 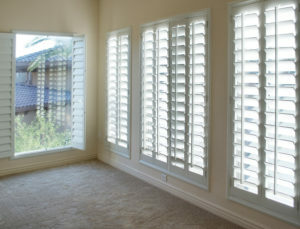 Custom shutters in Austin are a great investment in your home. Customization ensures that they fit perfectly, look great with all your home furnishings, and help you save on your energy bills. Our customized window treatments should last for the lifetime of the home, but if anything goes wrong with them, you can use the lifetime warranty to get the shutters or shades fixed. However, it’s best if things never reach this point — and you can prevent major issues with regular care and maintenance. Keep reading to find out how to keep your custom shutters in tip-top shape for the long haul! Perhaps the most important aspect of keeping your custom shutters looking their best is not surprising — it’s cleaning them regularly. Dust bunnies and other common household grime can build up on the shutters and around the gears, which can lead to malfunctions as well as a less-than-beautiful appearance. You should dust your custom shutters with a lambswool duster. Clean them seasonally with a damp cloth and dry thoroughly. While your customized window treatments are very sturdy and built to last a lifetime, you should still take care when opening and closing them. Never yank or slam your shutters, shades, or blinds. And, as fun as they may seem, keep little ones from playing with any automatic closures to avoid having them break or get caught. Often, if small problems are caught in time, they can be repaired far more easily than if the issue is allowed to worsen over time. That’s why we recommend people inspect their shutters, shades, and blinds at least seasonally. Take the time to go over the hardware carefully, looking out for evidence of broken pieces, tears, or little hitches where things do not maneuver as smoothly as they should. We are happy to offer a limited lifetime warranty on all products fabricated and installed by Southern Shutters & Blinds, Inc. Our other products are covered by generous warranties, as well. If you do detect an issue with your shades or blinds, don’t panic — this is exactly what the warranty is for! Get in touch with us right away if you notice anything that seems out of the norm. We will help you take full advantage of your warranty and get the problem fixed before you know it. To conclude, customized window treatments are a wonderful investment in your home — and taking good care of them can help to ensure they last for decades to come! Southern Shutters Shades and Blinds is proud to be the local business providing high-quality window treatments for Austin — and they have been for over 25 years. To discuss more about how to keep your custom window treatments at their best or to request a free in-home consultation, contact one of their locations today. Comments Off on How to Keep Your Custom Shutters Looking Great!